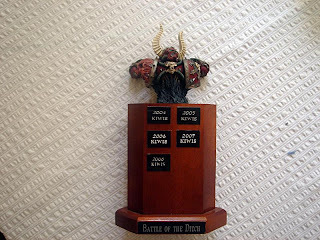 Since 2004 there has been an annual competition for trans-Tasman 40k dominance known as "The Battle of the Ditch". The event now has it's own trophy, created by Craig Maloney and painted by Ben Leong. The inaugural challenge was held at the 2004 Australian GT. Since 2005 the trophy has been contested at Liber Animus as a separate event. 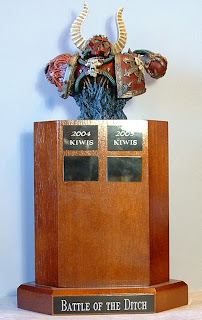 And here is the trophy in its current form, shields updated for NZ's 2008 win. Charlie St. Clair as newest NZ team member is current custodian. The event is in Wellington on the weekend of 28 February/ 1 March with a limit of 40 players. Since 1999 the New Zealand Grand Tournament has been known as "Fields of Blood" and was run by the local GW managers (with some support from GW Australia). Over that time because of GW's seal it has been the premier 40k event in New Zealand. 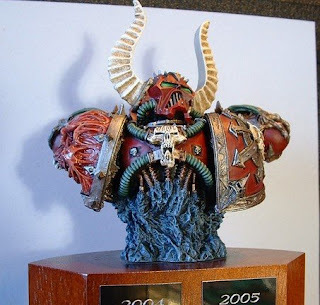 For a variety of reasons GW decided not to run the event in 2008 and as a result it looked like NZ would lose it's most prestigious 40k tournament. Not keen for that to happen I put up my hand to take over the organising, administration and running of the event, through my event vehicle DBM Enterprises. Over the weekend I took my Woodies to the Australian Masters in Sydney. I had dropped my Noble on Eagle for a second Mage and in the end I think this was a good decision (Thanks Nic Buckby for the suggestion). My army scored -1 average for Comp, giving it a 2.5 average. I thought that was a fair score and more adequately reflected the list than the 2.0 average I got at Orktoberfest. Three things stood out for me in this game. Rolling 17 on the Hail of doom and killing most of Steve's wraiths, the Treeman standing up to the Black Knights for most of the game unable to kill them off. And my 14 Dryad attacks and 4 KB attacks on Steve's Lord resulting in him having to make one save. I eventually (Turn 5) got Steve's lord and was able to grind out a solid win. This was my first game against Steve and he was an excellent opponent. When I walked into the hall on Saturday Jeff told me he had beaten my army on Friday, so when we matched up round two I wanted to see whether I could do better than Ken Ferris. We were both playing a cagey game, Jeff hid his light stuff, I advanced through woods. The key to the battle was two miscasts. One by me that allowed Jeff to cast Gateway (cost me a scroll) and the second by Jeff sent it off with IF. That spell sent the Treeman into the warp. This came was close, competitive and most of all fun. The 475 points I lost with the Treeman was the difference between us. If I had to choose an opponent to play every week Jeff would be the man. He is such a good general and fun to play. More than any game, this was the one I wanted to do well in. Gavin has been the benchmark for the past 18 months. Suffice to say I didn't play well. In fact, I played awfully. I got myself in a hole on Turn One and Gav being a frontrower squirrel gripped me for 6 turns. I was extremely disappointed I didn't do better and provide Gavin with more of a contest. My dryads snagged some points at the end - but too little too late. As expected Gav was an excellent opponent. Chris's army had a lot of shooting both from dwarfs and bolt throwers. I thought I played the game well in that I made sure that Chris only had limited shots and none against my Treeman. Throughout the game Chris' bolt throwers were cursed with poor luck (they must have been saving themselves for the big tree). I eventually got some wild riders into his lines and with a number of failed break, panic and terror tests I was able to grind out a win. Certainly the terrain and dice favoured the Woodies in this game. Chris was another great opponent. When I looked at Chris deployment (castled around a hill) I knew I was in for a tough battle. Similarly I knew he had to come through three woods to get me. I worked out where I could get points and set about trying to snag him. In the end the game was very tight. I took out Chris supports and he got his King's unit into some of my softer units. Luck across the table was fairly even though I managed to survive what could have been a costly panic at the end. I felt that Chris deserved more from this game as he made most of the Turn 5/6 running. Continuing the theme, another excellent opponent. Competitive but both extremely fun and reasonable. Always be keen to clash again. I fancied this matchup all weekend. Aaron army was very small and I thought I could make quick inroads. In an effort to remove a unit of Seekers I split my BSB from my Treeman. First turn saw me put a couple of wounds on the KoS, wipe out some seekers and really hurt the Fiend. Aaron tossed up whether to venture the KoS out or keep it hidden. He chose the former and was able to siren in some dryads. Next door daemonettes charged the Treeman and this combat was to continue for a few turns until the KoS joined. The Treeman survived a stubborn check on 7 (three dice) to prolong the combat but I couldn't get strikes on the KoS. Eventually she broke and was run down. I doubt whether the presence of the BSB would have helped given the 3D/-2 combo. However liked my chances in the centre where a unit of Guard had held up his BSB's daemonettes (Insane Courage). Into the flank go two units of Wild Riders (one regenerating) and do nothing for two turns. A combination of above average wounds coupled with no saves from the Riders (over two turns) saw them joined by the KoS and break. On the last turn I got a wound on the KoS with shooting to drop it to half points. Another great opponent and game....we laughed, we cried, we cursed each other's luck etc. So in the end I finished on 58 battle points, 2 below par (10th out of 16). I was extremely happy with that, having set myself a target of 50. With my comp I was jumped by two players and I jumped two back to finish on 10th Overall. The only change I'd make to my list is to drop a unit of Dryads and beef up the Wardancers both to 9 and spend the rest on extra Glade Guard. So what did I get out of the weekend? Everything I hoped for and more. I played 6 great opponents and played five tight and competitive games (sorry I wasn't more of a fight for Gav). The event was a fantastic experience and one I am glad (and proud) to have been a part of. To get to Locky's on Sunday night and see the net interest that it generated was fantastic. Well done Nasher, Dru and Prox on enriching the experience. Special thanks to Marc and Conrad for giving up their weekend so that I could play toy soldiers. As a TO myself I know it can sometimes be a thankless task. Thanks to all the spectators that called in and said hello and to the guys from Podhammer for their efforts. Finally thanks to Irresistible Force (especially Andrew Galea), the sponsor, my opponents and other participants for letting me experience a pretty special weekend. A couple of months ago I took my Wood Elves to Call to Arms. I had just finished painting the Ultraforge Treelady to use as my Treeman Ancient. Over the five games I managed to incur 29 wounds on her – that’s no way to treat a lady!!!! Both Skitterleap and Fields of Blood saw her fortunes improve – don’t mention the incident at Fields where after killing a Tomb King she went from unscathed to dead by failing the Curse – so I was hopeful at Orktoberfest she reach her full potential. Now I always thought Australia was a dry country, especially in Queensland where parched is a way of life. But I was to discover different. Armed with my trusty free wood I ventured out into the amphitheatre which was Orktoberfest. Sean was a great guy to play, a barrel of laughs through the game – including doing tricks like exploding two cans of V in his bag as he reached for his rulebook! For me the real threats in his army were the two Giants and the two units of Squigg Hoppers. I managed to neutralise the first unit of hoppers through a HoD arrow and a Wild Rider charge. The second unit was left short of its intended target by a poor Gork/Mork movement roll which meant they were charged (and destroyed) by a unit of Dryads. Sean accounted for two units of Glade Guard, the first in a lone charge by his BSB and the second when the Big Uns rumbled up and over a hill (and my poor unit). Wardancers extracted revenge on the BSB a turn later. My Treelady caused the Warboss’s unit to flee after she stranglerooted them but then finished the game by playing Hide and Seek with Pa Giant. Ma Giant took a stroll once too often in front of my archers. Really fun game where the Woodies prevailed by neutralising the key threats. I thought Sean played very well given it wasn’t a great matchup for him. Nick had recently started playing DE and was almost finished painting his army. He had a very fair list with the key threats being the Hydra and the single Repeater bolt thrower. During deployment I stretched Nick’s army out and was able to use the Wood Elves’ greater mobility to roll one flank up (taking with it a Mage, Corsairs, Archers and the RBT). On the other flank Nick charged the Treelady with his Lord and Cold One Knights. I was able to challenge and hold. Over subsequent turns I was able to bring Wild Riders into the Lord’s flank to add CR to the combat. With the Treelady killing the Lord the COKs broke and fled the table. I was able to spend the last few turns killing the remaining DE units. The Hydra was subjected to the full WE bow output and went down before it could make contact. Another fun game against a very nice opponent. The game also witnessed the greatest hail storm I have ever seen. Someone up there had clearly emptied their chully bun. Very difficult army to get points out of. Three blocks of Plaguebearers each with a Herald, two beast units, two nurgling and two fury units. Decided early on that my best hope was to try and get one block of Plaguebearers plus supporting troops. In the end it cost me a unit of Wild Riders but I managed to kill one unit of Furies, one and a half Nurglings, one of Beasts and half a Plaguebearer unit. The Treelady also managed to kill half the Nurgle General. Clinton was excellent to play and it was a tense and tactical battle. In the end I was happy to walk away with a small win. Haig’s army was a tough matchup for me. He had a Stank, two cannons, a Hellblaster, a big unit of ICK led by Grandmaster, a smaller Knight unit and a Hero on Peg with the Stealy Casket. Decision time. To Stank or not to Stank. I decided not to use the Treelady to fight the vehicle as getting points is never easy AND I had nothing else to fight the ICK. I deployed by placing 3x archers and a unit of Dryads up against the Stank, a cannon, pistoliers, warrior priest and archers. Helping them out was the eagle noble who proceeded to roll 18 for HoD. I wiped out the Pistoliers but not the priest. Over the rest of the game the Priest and tank took out that whole flank. First bit of luck was one of Haig’s cannons blowing up in Turn One. He then ran his Peg Hero up to stop me moving woods. I stranglerooted his Peg but the Hero jumped into the woods, stole regeneration and then charged Wardancers with BSB. Neither of us challenged and I breathed a huge sigh of relief when my BSB survived. The Wardancers were able to kill the hero. Next turn the ICK charged the Treelady. She challenged and the Grandmaster refused going to the second rank (boo hiss). I was able to hold and on the next turn get the GM into a challenge. This went on until I was able to bring in two supporting Wardancer units who with the Treelady killing the GM were able to break the unit. They got away but were re-charged after they rallied and I was just able to win that. In the last couple of turns, Haig pulled some back by using the other unit of knights to kill a unit of Wild Riders (not happy) and then a unit of Dryads. However the biggest surprise was a half unit of sword and a mage beating up a unit of Wardancers. When we added things up we each had 300 bonus points and had additionally both killed exactly 1375 points. So the closest of draws and a fantastic game against a great opponent (Haig got my Best Sport vote). Evan had four lances of knights (including one of Grail) plus a unit of Pegasus Knights and 3 blocks of MAA. I was able to get ahead early in this game before Evan’s greater skill and experience started to pull things back for him. A critical error in the last turn by me – I moved my BSB away from an important combat where I eventually lost by 1 – cost me the draw. As a result of the error I lost 2 units of Glade Guard and a Mage. However my Treelady again excelled herself. After three/four losing rounds of combat she killed the Bretonnian Lord who had charged her with KotR. I taunted Evan by failing my first break test in three of the rounds but the lurking BSB always gave me a successful re-roll. Another very enjoyable game against a great opponent who I had been keen to play. It was no surprise when Evan came 3rd. Ant had one of the nicest Vamp armies I’ve seen. I mean that both in terms of painting and comp. Presentation wise a lot of love had been spent on the army and it really showed. It got my vote for nicest army on show and I wasn’t surprised to see it podium in Players’ Choice. Comp wise it was really well balanced with 3 Vamps, 2 units of Knights, a Coach and a Varghulf being the main hitters. The game was very tactical. I thought Ant out-deployed me and then pressed that advantage home. I lost my BSB and a unit of Wardancers early to poor play on my part. Over time I clawed some points back and the game was on a knife-edge. Ant put a unit of Skellies with flaming attacks into my Treelady. In the front rank were his BSB and Vamp Lord. I was able to kill the BSB in a challenge and then managed to get a unit of wild riders into the flank of the skellie block. The Treelady then managed to kill his Vampire Lord in challenge and the VCs started to crumble. In the centre Ant’s Knights and coach took out a unit of Wild Riders, my Eagle Noble and a unit of Glade Guard. We had to call the game at the end of Turn 5 and I was ahead (and I suspect the crumble would have helped me Turn 6). Ant had been ahead much of the game until the Treelady saw to the demise of his characters. So overall I finished on 77 Battle Points which was 5th highest. I didn’t drop points in Sports and Presentation but suffered in Comp. My overall result was 11th which I was really happy with having set myself a Top 20 target. In reflection it was a typical Pete Dunn tournament result – majority of wins but lacking the big points to really push ahead. What I was happy with was the use of the Treelady. I felt I used her far more proficiently than I had recently. She participated in all the big combats and I was able to make her the anvil to neutralise enemy characters. Her headcount was impressive given she only went to half points once and never ran away. So 4.5 of the six Lords faced….not a bad day in the glade. The sheer number of forests on the tables I played was extraordinary – 20 (+ my six free ones) in six games. Welcome to the lush rainforests of Queensland. I had a great time over the weekend. My opponents were excellent to play and the armies I faced ranged from very fair to very solid. Thanks to Carwyn and his crew for a great tournament (and the lift to the venue) and to all the Australians for making me feel welcome. That’s the end of the road for me and the Woodies. I’ve played them solidly for the past year and now I need a change. The next cabs off the rank for me are my recently finished Skaven and a nearly painted Vamp army. I’m looking forward to the challenge of playing with ranked units for a change. Over the weekend played at Guardcon’s Fields of Blood (which was a replacement for the NZGT). I took my Woodies, making several small changes to the list I used at CTA to hopefully better deal with the Daemon armies I expected to face. Game was characterized by two highlights. First my fleeing eagle-mounted noble surviving a direct hit treb shot that misfired followed by a second hit that rolled “1”. Invigorated by this, he proceeded to run down the fleeing Bret pegs who failed a Terror test. The second was my Treeman Ancient dying on the last roll of the game after eight rounds of combat with a Bret Lord she wounded once. Again two highlights. Me burning both my scrolls on Turn 1 to ensure that my Wild Riders were able to charge a corner sitting SS catapult turn two. Once gone this allowed my Treelady to emerge. She chewed through an archer unit and then was charged by the Tomb King and his TG retinue. On the second round of combat I proceeded to kill him, rolled 10 for The Curse and Josh rolled a “6”. A new and entertaining way to lose 500 points. Turn back the invading infidel! Again there were a number of moments of note. The failure of my Hail of Doom on the Pegs; A redirected charge into a unit of Errants with Wild Riders where the odds were with Marcello (+2 CR going in) but I survived and broke him second round. I was unlucky however when a unit of Wild Riders went into the rallied pegs and Marcello killed my BSB and held in combat then rolled me in the second round. The odds said it was mine but luck can be a fickle friend. I then made the mistake that probably cost me the win. Rather than retire my Wild Riders with captured banner to the far corner I went in search of cheap points….bad decision that eventually cost 374 points as Marcello skillfully hunted them down and killed them. Marcello was unlucky early with a failed charge by his Bret Lord on my Treelady who buggered off to kill some Grail Knights (eventually). This was the first game in awhile where the Treelady hasn’t died. A triple mix of daemons led by GUO with regeneration and the usual suspects – flamers, horrors, Tz herald, unit of Plaguebearers led by Palaquin Herald BSB with Hellfire Banner. Ray had 11 PD and 8 DD. I managed to kill everything but the GUO and the Herald led Plaguebearers (for little loss) but this only netted me 965 points. I did get a banner and three quarters though. Simon said that his initial list had been returned (16 PD Tz daemons) and so instead he took a Dwarf list. He had runed up infantry blocks of Longbeards, Hammerers and Warriors, Oathstone etc backed up by runed bolt throwers, emplaced organ gun, big block of miners, Thunderers, gyrocopter and the Anvil. Unfortunately for me Simon deployed in a 15” area on a hill in the corner and gave me the first turn. I managed to damage the gyrocopter which I later killed. I then only had to survive six turns of anvil goodness. I lost a unit of Wild Riders and half units of Wardancers and Glade Guard. I did manage to surf some dryads into his quarter and defused the Miner charge threat. Last two turns Simon marched infantry forward so he could Anvil them into quarters on last turn. The game was over in 35 minutes with Simon slightly ahead on points. Pretty hard game for Woodies but them’s the breaks in the big city. Great to finally play Doug. His army was based around the firepower of his Maneaters led by Tyrant and bruiser and four units of Leadbelchers. With a lot of longer ranged shooting I was likely to have an early advantage. I played a refused flank with my archers and put my fast stuff on the other flank up against slavegiant, Hunter and gnoblars. I managed to get some second turn charges off that had most of that flank fleeing or dead. However in the centre I had placed my eagle to march block Doug’s flank. The brave eagle was able to hold when charged and when he eventually fled he survived numerous handgun shots before making a break for safety. Incensed by this Doug’s Tyrant went after him in the last turn but still he survived this final volley. Through a mix of shooting and my greater mobility I was able to clean up a lot of Doug’s army sans Maneaters and main characters. So four wins and two draws for 79 points. Still I failed to grind out the big wins I really needed. I think it is a combination of my style of play coupled with the odd time where I give unnecessary points back (e.g. The Curse, losing my Wild Riders vs. Marcello). I did however keep my Treelady alive for the last four games which on recent results was an achievement. However I had five really good games and six great opponents and most importantly had a lot of fun. I finished up 5th Overall which when given the caliber of the placegetters I was more than happy with. Thanks to Dave Stent and all the participants for a great weekend. Liber Animus V was held over the weekend in Melbourne. This was the fourth Liber I had attended. Over the past year I have been playing Fantasy rather than 40k and went into the tournament having played only 10 games in the past 12 months (largely as bye buster at two tournaments I ran). There were 13 Eldar armies (4 of the 8 New Zealanders) playing in the event so prior to starting I called a Jihad on all Eldar commanders. The game was really tight because the Thunderhawk did not turn up until Turn 5. I spent the first few turns sniping Dreads (successful), Plague Marines (not successful), Mark doing the same. How often do you get 6 Dreads on the same table? On Turn 5 the ship showed up. It promptly scattered onto my Librarian who in one of those fine cinematic moments, sensed its presence and tried to catch it – unsuccessfully! Game ended in a draw which was fitting given how tight it was. Mark was a truly excellent opponent and it was no surprise when he won “Best Sport”. Jason had travelled from the West Coast of the USA for this tournament. He had a very nice and crisply painted army featuring four Plague Marine Squads in rhinos, two Vindicators, a squad of marked Terminators and a nasty Lord in Terminator armour. The mission involved getting the most scoring units into the two 15” corner squares on your opponent’s side of the board. Clearly the mission suited a Drop pod army however it was still doable for Jason – unless he split his army. Jason split his army into two equal parts, each going for one of his two target corners. This allowed me to concentrate my force on one side of the board working on the basis that if I destroyed one half of his army with mine I would be able to achieve a greater number of units in one of the target corners while ignoring the other. Game 3 – Travis Cooper (Chaos) in Grab It! So Round 3 and my third Chaos opponents. I had exhausted all Nurgle options so Travis’ army was Undivided with Noise Marine support. In this mission you had to hold the most designated terrain pieces. Again this game had a number of “cinematic” moments; the most notable ones were the dysfunctional dreadnaughts and the retarded squad leaders. In the first involved a round of combat where two dreads failed to hit each other then next turn ensured mutual complete destruction. In the second, one of my tactical squads immobilised a rhino forcing the Noise Marines to disembark. The NM Champ opened up with his Doom Siren covering eight of my squad. Unfortunately he had bought the Kazoo version and only killed two. They then charged and were reduced to a single marine and the Power Weapon wielding champ. With “fearless” roll it dropped to just the Champ. Next turn he killed one Marine and my squad and a 3 attack Vet Sgt with Power Fist failed all theirs, broke and run. The Champ chased, doom sirened three in the following turn and then promptly missed with 4 Power Weapon attacks against the Sgt. This time he was squashed for his troubles. So in the end I held three terrain pieces to none and managed to secure the victory. On Saturday night we had the traditional Battle of the Ditch between Australia and New Zealand. Instigated in 2004 the New Zealanders have managed to secure this trophy each year though last year was a real nailbiter. This year there were seven games. New Zealand went out to an early 3-1 lead with Hagen and myself drawing and Alan Borthwick and Charlie St. Clair winning. However things in the other three games were very touch and go. Kane squeaked a win out against Jack Dunn bringing it back to 3-2. We had to wait a further two hours for the final two results with John Tailby and Dan Atrill finishing in a draw after a nine turn game and Jason Isaac coming from well down (in fact gone) on Turn 4 to squeak a win. So 4.5 to 2.5 to New Zealand. My game versus Tom Damin was very tight. I managed to bring down three of Tom’s units to below scoring on my Turn 6 to scrape a very fortuitous draw. Another game over five years in the making. I first met Kane in 2003 at the Sydney GT and since then we correspond regularly….again we had never played. We were both very happy to finally get the chance to game. The mission was Hero but really was a Take and Hold mission with each of us having our individual objectives. My objective came back 4” but Kane’s scattered a whopping 10” back placing it 6” from his base line – Great. Because it was an Escalation mission I had a great chance to cause havoc in Kane’s army before the Avatar turned up. Of course my Librarian decided to have a sleep-in so I didn’t get to “Filth of the Darkness” his Avengers. My Chaplain also had a sleep-in turning up on Turn 4 as well. However the funniest arrival was that of my Hero. I had made him a baby Drop Pod. Taking the least favourable option i.e. not attaching him to a squad offtable, by the time he was due to arrive all the pods had landed. Therefore he walked onto the table on Turn 5. There were a few highlights in the game from my point of view. Kane had been very proud about the survivability of his Wraithguard unit. When I killed nine in one turn of shooting he was a little less chipper. As is the case though the sole remaining guy and his Warlock minder killed my Venerable Dreadnaught next turn. Prince Yriel charged one of my other Dreads (who had previously lost his CCW arm). He managed to score three penetrating hits stunning it and removing its other arm. My Dread fluffed his attack back. Next turn Yriel managed three more damage rolls, immobilising the dread and stunning it again. This time my Dread didn’t miss, ending the career of the poncy eldar pirate. The final highlight was the fight between the Wraithlords and my Termies. I managed to reduce one to one wound before they both charged my squad. Having killed one termie from shooting Kane had high hopes of killing the squad…..nada. Oh how we laughed. My six return attacks all failed to hit the constructs…..that wasn’t so funny. This went on for awhile and at the end of the game one of the Wraithlords was still trying to kill the Librarian. The game ended in comic farce. In his last turn Kane moved his Wraithlords forward. The non-scoring one to get a shot on one of the units holding my objective and the other (scoring) into my fleeing Librarian. I thought he’s pretty confident, moving a potential scoring unit out of zone but thought he was after bonus points for most expensive unit. When he didn’t move a squad of Dire Avengers into zone I started to wonder what he was up to. Kane removed one of my scoring units and the game ended. Kane’s smile disappeared when I said 1-0 to me. Kane - “No it’s 3-1 to me”. Pete - “Ahhh no….you have no units in 6” of the objectives”. Kane (reading mission) – A series of very naughty words. Given the stuffup I offered to call it a draw which is what it ended up. Great game and no surprise when Kane picked up 2nd Best Sport. Thanks for memorable game mate. For the last three Libers Myles has been the technological expertise behind the event. It was excellent to see him at the table this time. He had brought a Necron army with strong base of Warriors, a squad of Immortals, Flayed Ones, Destroyers, Wraiths and Scarabs. He had two Lords and a Spyder. I figured that the best way to score Battle Points would be to phase him out, so that was my plan. My mission was to take the centre and I realised pretty quickly that Miles had to get into my deployment zone. First couple of turns saw me whittle away the Flayed Ones and Miles destroy one of my Dreads. The real action started on my Turn 3 when the Termies showed up. I got lucky with “Filth of the Darkness” which caused a unit of Warriors containing the foot Lord to run off the board. I brought most of my guns to bear on the Immortals, managing to wipe them out. Myles’ Monolith was hurting my units with its flux arc but unfortunately I was making a good number of saves (or in the case of the Dread was only stunning it). On Turn 4 I applied the squeeze. I managed to hit a Warrior unit with three of mine, and then caused the remaining Warriors and the Destroyers to flee with “Fear”. I knew that if I could win the combat and consolidate then I would win the game as both Myles fleeing units would be unable to rally being within 6” of my troops. In the end my superior numbers paid off and at the start of his next turn Myles phased out being two Necrons under the required level. Aaron had a marine list with two Terminator Squads, two Venerable Dreads, two Tornados, standard Tactical Squad, small Squad in Razorback, small squad of Assault Marines, a Whirlwind and a Land Raider. The meeting was an Escalation mission. I got lucky in that only three units (both Dreads and a CCW Tatical Squad) turned up on Turn Two. This meant I’d see more of his army before I had to commit my 6 remaining pods. Aaron was unlucky in that the majority of his units turned up. He wiped out a Tactical Squad and started what would be a marathon combat for his Terminator Squad versus my Dreads. He was very unlucky in not being able to finish the front dread off. On my Turn 3 I got the rest of my army bar the Ven Dread and was able to cause a world of hurt. I managed a Fury of the Ancients shot through 4 units, hurting Assault Marines and bringing down a Tornado. My other shooting wiped out the remaining Assault Marines and the second squad of Terminators as well as causing a wound to the Librarian and snagging more Tactical Marines. The remaining parts of Aaron’s force showed up and he threw everything…..and when I say everything I’m pretty sure a kitchen sink flew past…..at my termies. Assault cannons, heavy bolters, lascannons all came their way …… and at the end one dead terminator. By law of averages he should have got three. I was very very relieved. In the centre one of my units took casualties and started falling back. It was never to rally as it always had enemy within 6”. Aaron charged his Librarian who had joined a Tactical Squad into my Chaplain’s squad. Over the next two turns they were finished off and my Chaplain was able to go after Aaron’s Termies who were now past the front dread and onto the second. My terminators were able to destroy the Land Raider from shooting before they were assaulted by one of his dreads. Again my termie squad wouldn’t die, tying up the dread until the end of the game. Aaron’s other dread bagged my second bolter squad causing it to run so it never rallied. My late arriving Venerable Dread was able to destroy the second Tornado before it smashed the Whirlwind. In the centre the second dread continued to hold up Aaron’s Termies who were eventually killed by my Chaplain’s squad with him taking out Aaron’s commander. So a very brutal game where Aaron suffered less than average luck. I finished on 101 Battle Points, one behind Alan Borthwick. Liber counts down the placings and so when I was called up in the last three I was pretty happy. I had been there twice before finishing second at LAII and Liber III. Leigh Tressider was 3rd (which would have made his father proud) leaving two New Zealanders, Alan (who won it last year) and myself. When Al was called in Second Place, I was pretty ecstatic. Finally had the Comissar monkey off my back. I was very humbled by the result and really appreciate those (starting with Al) that offered their congratulations. I believe I had a good solid army that can play a limited set of tactics and win. However I would say I was lucky with my draw – I never got the hth horde or highly mobile armies that could expose the list. The other thing was I played a great group of opponents and had probably the most relaxed tournament experience I could have. Thanks to the seven guys I played. As much as I enjoyed winning the biggest buzz I got was seeing my son Jack pick up 3rd in Players’ Choice. He’s fifteen and has produced a really high class army. It was great to see all the time and effort he put into it be rewarded by his peers. Cheers to the rest of the Nzers who made the trip.....and to the local Vics and out of staters. Finally, thanks to the organisers. I was a bit flat going into the event but Brad, Dan and Rat created a really relaxed tournament with an outstanding bunch of blokes attending. Well done guys! I made the decision pretty late to attend DogCon, not deciding until late December to make the trip across from Wellington. Although Warlords is a large club (120 members), the GW presence is very much towards the 40k end where club members have been able to compete very successfully intrans-Tasman tournaments over the past 5-6 years. In the past year or so I have started to play more Fantasy and it has become much more popular at Warlords as the period of choice for a lot of the new younger members of the Club. We’ve run a Mighty Empires campaign etc but the general standard is pretty rudimentary. Auckland remains the NZ Fantasy heart so games against the best NZ players are few and far between. Last year I played Ogres at the two NZ GTs and was lucky enough to guide them to 3rd in Welly and 2nd in Auckland. This year I decided to try an army perceived as stronger and purchased a Wood Elves army. Locky offered to put me up for the weekend and very grateful I am. The chance to pick his and Pommy Dave’s brains was an added bonus of the weekend. I arrived at the hall on the Friday night just in time to set up the tables – should have stopped for that coffee!!!! After a few beers and a quick meal, we crashed Evan Ferris’ place for poker. I was quickly cleared out by Priest so home for an early night. I had tried out a Lvl 4 Mage plus Treeman build but found that I was putting my Treeman into places where eventually he made enough tests to run away. This forced me along the Ancient route. It also freed up enough points to buy the 4th Treekin. Having played OKs I found that the fourth model was necessary to give you the option to go frontally vs. ranked units. The banners on my Glade Guard were there to avoid cries of points denial but I found in practice games that the presence of 300 “free” VPs meant you could know roughly where the enemy would attack. Rather than go through a blow by blow, I’ll detail my results and the highlights of the games, and then what I learned for next time. One of the attractions of DogCon was the opportunity to play nine games against good quality opponents. Having both a singles and a teams competition was a fantastic concept as it allowed a pretty relaxed introduction to the weekend. In was in “Team Insane Panda Roadkill” with two of the Aucklanders - Chris “Big Show” Townley and Alex “Panda” Phoon. I felt inadequate without a nickname so I’ll import my old 40k one “Mr. Soft & Fluffy”. Going into the last round we were propping up the table. We hit our straps in the last round and finished on 77 points about 5-6 places up from the cellar. In my three games I played Matt Cole (Ogres) for 10-10, Richard Annear (Daemonic Legion) for 10-10 and Eddie Crompton (Tzeentch Daemonic Legion) for 20-0. I managed to pick up 40 of the 60 points on offer. This was the first time I had played Daemonic Legion and to say I had a steep learning curve was a bit of an understatement. Against Eddie I was having my eyes picked out until I managed 7 charges in the third turn which changed the nature of the battle. Richard’s Daemon Prince had the Flaming Sword as his spell and instead of using my scroll I tried to use three dice and failed. This gave him 5 attacks on the charge vs. my Wardancers. With his re-rolls he hit r times and then rolled 4 “1”s. With outnumber and musician I beat him and he rolled a “12”. My, how we laughed. So onto tournament proper and my grudge match versus Jeff Galea with his High Elves. I managed to kill his Dragon Mage with some lucky rolls from my archers and his Dragon decided to be stupid for the rest of the game. The game was very brutal with a large combat in the centre of the table which turned into a grinder for both of us. In the end Jeff managed an 11-9 win in what was a very enjoyable game. Having now played Daemonic Legion twice, I was now an old hand. In the second round I drew Tim Cross with Tzeentch Daemonic Legion and we battled out a tough game with me eventually winning 12-8. This matchup is tough for Wood Elves (IMO) so I was very happy with the result. Last game of the day was against Akhter Khan’s Vampires. What a pleasure Akhter is to play (probably no surprise to you locals). I really enjoyed what was a pretty close game where I managed to ride my luck early on (the Hail of Doom accounted for 5 Black Knights) for a 12-8 win. Now being starved of regular play I took the opportunity both nights to play a further game. On the Saturday Antony Kitson’s Brets took me to the woodshed while on the Sunday Mark Skilton was cleaning my clock when they turned out the lights. I will say that I always reserve my worse play for Mark, something he takes great delight in. Thanks guys for giving me the chance for two further games. On the third morning I was drawn against Eddie again and after some discussion between Ken and those of us on the same points, the draw was adjusted so I could play another “new” opponent (thanks guys). I played David Potts (Ogres). David had a very fair list which when I looked at it was an obvious candidate for the +1 Army Point. This was always a hard matchup for David and so it proved with the Elves triumphing 20-0. My next game was against the second of the Galeas, Andrew and his Orcs. Andrew has already posted an account on the IF website but from my point of view this was one of the best games (any genre) I have played. The swings and absolutely crucial die rolls occurred every few minutes. At the end of Turn 3 I felt I was reasonably comfortable as long as the Treeman stayed. Of course he didn’t and Andrew got a well-deserved 16-4 win. The last game of the weekend was versus Michael Fair’s High Elves. I believe that Lvl 4 / Lvl 2 Dragon Mage with 9 PD, Lore of Fire, 20 archers and 2x RBT with hill in deployment zone is a VERY poor matchup for Woodies. As it transpired Michael deployed on the plain and I behind the woods. After two Conflagurations I decided to stay there and Michael chose not to approach. A tame 10-10 but we were both happy to go and watch some of the other games. I really enjoyed DogCon. Ken did an excellent job and every game I played was both fun and good natured. I’m not a fan of his 4+1 system for soft scores. I think you need to play all your games to accurately divvy out the bonus points. Certainly Akhter would have got my Sports if it hadn’t been Round 3 – and he deserved it (add a point to your score young man). Still Ken was TO so we play his system. What I was very impressed with was the good naturedness of the tournament. I don’t think I witnessed any niggle over the three days. Certainly there was sense of fun that some of the 40k tournaments I played in lack. So how did I do? 27th. I had hoped to make the Top 25 but finished just outside. Overall I was very happy as I felt that I had had some testing matchups. More importantly I had some great games against really nice opponents. I’ll definitely be back. My army went well though I’m not convinced on the Lvl 1 with 2 Scrolls and may in future upgrade to Lvl 2 to use all my PDs. The standards on the GG acted as bait and I think I lost only 1-2 all weekend. The CR +4 they put out when on a hill can be a bit of a shock to some. I need to learn to play skirmishers better – I only realised on the way home that they can screen – doh! Congratulations to all the winners. Thanks to Ken and the Dogs for organising it. And thanks to Locky, Dave, Chunky and Ming for being such good company. Nice to meet up with Charles and GT again and to put faces to some of the other names/handles. Over the weekend the second of the New Zealand GTs was held in Auckland. They used the same GT pack that has been in use across Australasia this year. Michael had 3 big ranked units (30+), two engineers, a Seer with Bell, an assassin, Cannon, big unit of gutter runners and big unit of night runners. The army was very magic heavy – I think he said 13 PD. I moved my full army up towards him and then peppered him with the Ogre panic spell until he eventually failed a test. He lost both his slaves and night runners to this tactic and I was able to kill off his ratling guns with bangstick and magic missile. I will say my dice were very good this game (and indeed the whole tournament bar one or two notable exceptions). Once I had reduced his units I was able to set up a flank charge on the bell unit and then turn to face the assassin led gutter runners. At the end I wiped out the army for the loss of a unit of Gnoblars. There had been a bit of banter across various forums in the lead up to this GT with Dave. Dave is a recent arrival from the UK and had a very nice Bret army themed around a dragon-slaying theme. My memories of this game are of “Defeat snatched from the jaws of Victory”. I managed to get well on top early getting his trebuchet, yeomen, some archers, Pegasus knights, KotR and Lord early on. Again I felt my dice were very good and I had bantered Dave into letting some spells through on his Lord which were enough to kill the ponsey git. And then it all went wrong….and how! Dave tied me up with his Pegasus hero which stopped me organizing my defence for the coming charge. I managed to get off a few magic shots and some sharp stuff to try and kill him but he shrugged it off. The yeomen and archers who were both 1-2” from the board edge rallied and were able to quarter grab on Turn 6. However the main event was in the centre. When Dave’s knights hit the Grail knights went straight through a unit of Ironguts while the other unit got held up in the first combat round. I needed to get off a spell to try and beat them in the second round but my Butcher with Siegebreaker was on two wounds. I successfully got off Toothcracker rolling a “9” and smiled smugly as Dave had a single die left. My smugness turned to aghast horror as he pulled out the Silver Mirror and explained what it did. Butcher now on 1 wound. No worries, I can cast Trollguts and get Regeneration……oh sh#t, that will kill my Str 7 guy. I bottled and didn’t do it…in retrospect I should have. Dave spent the last turn mopping up some easy VPs and at the end was 484 points ahead. So a Minor Loss. Curses!!! I’ll get you next time! Very disappointed we didn't see you Saturday night. Piker. Paul had a great Night Goblin army. Led by Skarsnik he had five big blocks of NGs, a block of Archers, two squig herds, a unit of hoppers and two chukkas. Sprinkled through the units were (I think) 15 Fanatics. To combat the Fanatic ones I deployed one unit of gnoblars and the trappers across the front of my army. The other unit of gnoblars knowing of my plan decided to turn up late!!!!! As mentioned earlier I had good dice for 95% of the weekend….unfortunately Paul didn’t. On every turn one of his two shamans squabbled so his magic offence was limited. I was able to destroy the goblin herders on one herd and they exploded 9” affecting 5 units. As the Fanatics were released they culled the gnoblars but then Paul’s amazing run of doubles came into play. His hoppers destroyed the trappers before they were hit by a unit of bulls. The gorger cleaned out the two chukkas and I was able to turn a flank and then run along his line with two units of IGs. The last couple of turns were nasty for the NGs and I ended up with a pretty solid massacre win. Rob had won the NiCon Fantasy competition with his Empire army. It was built around solid blocks of troops supported by detachments of archers, a hellblaster, a cannon and a Popemobile. I was very nervous of Rob’s shooting…as an ogre general is when he sees a warmachine or peasant with a bow. As I result I decided to play refused flank and move most of my army up one side of a wood hopefully shielding me from most of his firepower. Rob had bad luck with his hellblaster which misfired twice in the early rounds and then had little opportunity for a shot in the rest of the game. My gorger ate the cannon and then most of a unit of handgunners while Rob chipped away ogres with his magic and shooting. However the real action happened on the far side of the wood. The Popemobile beat a unit of Bulls and pursued after them running them down. This let me charge it in the flank with a unit of Ironguts and the butcher with siegebreaker. Rob challenged and I found my guts I had buffed to Str 7 were useless. However after van Horstman I had two attacks hitting on 3’s with the Siegebreaker against the wagon. Two hits…already to start dishing matchwood…yep…snake eyes. As a result over that urn and the next I lost that Butcher and the one in the IG’s unit….not best pleased. Finally the buffed IGs were able to finish sitting around and they finished off the Popemobile and His Holiness in short order. To make this work my second Gorger had gone on an assassination mission on one of Rob’s wizards hoping to reduce his magic defence. The gorger made short work of the magic man and then sat with his unit of Spears for the rest of the game. While this was going on Rob was whittling away Ogres and managed to get a charge with his Greatswords into a unit of Bulls that thankfully held. I then got off a charge with my second Bull unit into the Greatswords flank and they held. This left Rob the opportunity to charge the rear of my second unit and there was much rejoicing at the Great Maw when he failed his fear test. This meant that my flanking unit beat the Greatswords in combat and they broke and were run down….very very fortuitous. At the end there was 39 points between us for a hard fought draw. I was drawn against the Khorne army that had disposed of one of the Thoreks early on in the tournament. He had 5 Chosen Knights led by an uber Lord, a unit of 8 Khorne Knights with 2 Heroes in it, 15 Chosen of Khorne on foot and three units of three Chaos Ogres. Grant won the first turn and came flying across the table. I managed to reposition some gnoblars so his Chosen Knights had to charge. They ran them down and killed them but importantly were now out of the game for 1-2 turns. With so much magic defence I was struggling to get spells off but I managed to get Toothcracker on the Ironguts with War Banner on the hill. By the end of Grant’s second turn all his units were between 3-8” away from me. So it was a case of charge or be charged. In went the ogres and the results were mixed. On my left a unit of Chaos ogres smashed a unit of naked bulls. However next to them some bullgorger enhanced bulls managed to beat up and run down their mates. My Tyrant’s unit got the bull charge off against the Chosen foot but though they broke them they could not run them down. In the centre the unit with war banner charged the Khorne knights at the base of the hill. I was able to inflict a few casualties and while losing my IGs held due to their stubbornness. My Siegebreaker Butcher and his Ironguts took out the third unit of Chaos Ogres. Both my gorgers had arrived and I directed one towards the fight on the hill and the other lined up on the flank of the Chosen Knights. It was here where Grant made what I think was a fatal flaw. Instead of turning his Chosen knights back into the centre he turned them to face the gorger coming on from the side edge. In the centre the Chosen foot continued to run and the IGs on the hill continued to hold due to Toothcracker (Grant failed the Dispel roll of 7 required to remove it). My Tyrant ‘s unit shaped up to charge the fleeing Chosen Foot but the Tyrant failed his Stupidity roll and re-roll for the only time of the weekend. I had badly miscalculated my Gorger’s arc and he couldn’t charge the Khorne knights in the flank as was my plan. However his buddy tried to assassinate the uber lord but failed miserably and was cut down. The IGs on the hill were finally wiped out but they had bought time for the Siegebreaker Butcher’s IG to flank charge the Khorne Knights and the Gorger to hit the other side, finishing off the unit. The Chosen Foot rallied but were then charged by the Tyrant’s unit and fled off the table. On the last turn Grant repositioned his Chosen Knights and I managed to make the remaining unit of Chaos Ogres take a panic test and flee off the table. It was a very brutal game where I managed to eek out a solid victory (914 points). I was happy because I had used what I think were the right tactics and that coupled with luck saw me through. Now the only army I have ever played with is Tomb Kings so I was pretty happy to be playing it in the final round as at least I had a pretty good idea of what they can do. Josh had what I thought was a very good army – King with Destroyer, Prince on Chariot, two priests, Tomb Guard, Ushabti, Chariot unit, two units of skellies (one ranked, one archers), scorpion, catapult and a casket. He said that he had been getting some grief for having the casket but I personally don’t think it is a problem as it telegraphs your battle plan to your opponent. Josh chose sides and put the catapult and casket on the big hill in the corner, lining up the rest of his units near his back table edge with the Scorpion patrolling behind the Casket. His first turn killed an IG but that was it. I managed to run across the table on the next two turns and ran my Tyrant’s unit up the hill on the left straight at the catapult. On my first two turns I had used my magic missiles to whittle down the archers on my right so that the Heirophant had to leave them or risk having to take wounds. Josh made an error by moving him behind the unit on his turn three and I was able to execute what I thought was a pretty nifty trap. I drew out his dice by trying to buff the Tyrant’s unit and then opened up line of sight by using the bangstick to shoot the skellies archers. I then rolled two lots of two dice to get the missile off at the stranded priest. He blocked one but then wore 11 hits from the second one…..one dead mummy. My gorgers came on and one lined up next to the Scorpion. Tyrant’s unit hit the catapult killing the crew and lining up on catapult and casket. In the centre two units of Bulls hit the Ushabti and caused two wounds. The Chariots with Prince countercharged, wiped out one Bull unit and forced the other to flee. Josh decided to pursue rolled low and left his chariot flank exposed to two units of IGs. One unit of IGs hit the chariots destroying them, the Prince and the remaining Ushabti over the next two turns. They then over-run into the skelly block. The battle on the hill proved its own highlight reel. The Tomb Guard with King charged the Tyrant’s unit in the flank. The Tyrant challenged and the King declined sending forth his champion. Much ridicule of the king commenced from the Ogre side of the table and adjacent tables. Tyrant kills champion, ogres win combat, casket survives. Next round gorger goes into flank of Tomb Guard, Tyrant challenges, king declines and lets Liche Priest take it. More ridicule. Dead priest and casket. Ogres win combat. Next phase scorpion charges gorger, Tyrant challenges and priest has to step up. Much ridicule. Tyrant attacks, airballs, King inflicts two wounds. TKs win combat, Tyrant runs but Tomb Guard and scorpion pinned by gorger. Tyrant’s bacon saved. Much ridicule of Tyrant. The Tyrant rallies and the Tomb Guard are hit in the flank by the free unit of Iron Guts which wipes them out. In the end a massacre win to the Ogres but a game that had so many cinematic moments. So I finished with four wins, a draw and a minor loss. I think that was a pretty respectable return with the Ogres. The winner went through with six wins and there were a couple of players with five wins. I was absolutely stoked to win Best Sport. I had picked it up at last year’s GT and it feels really nice to win it again. My Battle, Comp and Sports were sufficient to give me 2nd Overall. The first of this year’s New Zealand GTs was held in Wellington last weekend. The format was standard as per the Australasian GT pack. It attracted a mix of armies and with more than usual the number of special characters on show. The only change from the recent Call to Arms was that I had replaced a unit of Yhetees with a unit of Bulls + two units of Gnoblars and replaced one Iron gut with a War Banner, Laurels on a Butcher and an extra trapper. Hugh had a Dragon, a big unit of Silver Helms, two units of archers, two of scouts, two bolt throwers, a unit of Swordmasters and five Dragon Princes. As I suspected he would, Hugh deployed his bolt throwers on a hill in the corner of his deployment zone. I then placed all my army (bar a unit of gnoblars that hid) on the far flank with a wood in the way. There was a gap I’d have to cross to get into his half but I had a plan for that. My gorgers arrived on Turn 2 setting up a Turn 3 charge on the bolt throwers. As Hugh turned to deal with them I scooted my army into the gap. One gorger died to missiles as Hugh opened up with his bolt thrower and scouts but the other managed to get in and beat the elves in combat overrunning into the second. Unfortunately for me Hugh diverted the dragon to deal with this gorger and he died pretty quickly. However I had got through the gap while most of Hugh’s army was out of range. Rest of the battle revolved around me picking off half the Dragon Princes with magic, doing the same to some scouts and pushing the Silver Helms back along their baseline as they faced off against ogres with Tyrant attached. Hugh charged the Silver Helms at the ogres and the big boys made short work of the elves, overrunning into the Swordmasters. These ran but Hugh rallied the below half unit in his final turn, also picking off a unit of bulls with the Dragon. When we totaled up I had come back to win by 450 points. Brett had a very nice Beastman army comprising 3 units of Centigors, four Beast Herds, four Chariots, some hounds, a unit of Beastigors and four characters (Beastlord, BSB and two Shamens). Brett kept his two big herds in ambush but deployed across the table, with his chariots split 3-1 on the flanks. I deployed in the center and to my right flank. The key moments in the game happened early. In Turn One/Two I rushed across the table and then Brett did his unruly and drunken rolls. Both small beastherds were unruly and headed to the ogres. Both were charged on Turn Two and were either caught when they fled or wiped out when they held. The centigors on my right became frenzied and charged at some bulls that fled allowing me to hit them with Ironguts which wiped them out. This set up a charge on the lone chariot that fled off the board. On the other flank one Gorger arrived behind the Chariots while the other arrived behind the Centigors. Brett charged the centigors into a unit of Ironguts who held due to “Toothcracker”. I was able to run in a unit of gnoblars to give ranks and won the next round with gorger in tow. The ambushing herds showed up and cleared my other unit of gnoblars out of a building, the other was beaten up by some bulls. On the last turn his two chariots lined up a charge on my Tyrant’s unit but were killed in the execution. In the end a win to the Ogres by around 1800 points. Gordon took a Tree Spirit army led by Drycha and 3 Branchwraiths. He had 6 units of Dryads and two of Treekin. Now you know the Great Maw is with you when you walk to your table to play Tree Spirits and it is a desert with three marshes on it. I looked at Gordon and he could see the sympathy I felt oozing from every pore. Gordon deployed with a refused flank and his “free” wood in the center. This suited me. I managed to box him in too a certain extent. My first gorger came on Turn 2 on the flank and was charged by Gordon’s most extreme Dryads. They proceeded to eat the unfortunate one by the time his mate turned up. He was also eaten by this dryad unit. On the other flank I was able to beat up one unit of Dryads who then rallied and killed their tormentors. Gordon charged a unit of Ironguts in the flank contacting the Butcher. My unit won the combat and was able to break the Dryads the following turn. On the flank where my Gorger were being eaten, I got a unit of IGs into a unit of Dryads breaking them and overrunning into Treekin. His other unit of Treekin charged my Bulls who fled. Finally the big fight – Drycha and two units of Dryads into my Tyrants unit. I challenged and like the old woman she is Drycha declined letting one of her children step up. Unfortunately for Gordon the Tyrant made a mess of her and when Drycha was less than successful, the Ogres were able to break and run down both units. In the wash up it was a win by just over 2000 points to the Ogres. This proved to be Gordon’s only loss of the weekend, which I guess, shows how much the lack of forests hurt him. I play Dawid at the Warlords pretty regularly. He uses a variety of Skaven armies but this iteration was based around three blocks of Clanrats, three units of Slaves, three units of night runners, two gutter runners, a BSB, an engineer, an assassin and a seer on bell. Besides the Bell, his only shooting was a single ratling gun and a single warpfire thrower. In the first few turns I was able to clear out the slaves through magic and the night runners with my gnoblars. My tyrant went straight up the center cleaning out some night runners and a unit of clanrats. The key combat occurred when the bell charged some IGs and the impact hits were insufficient to hurt the unit. I was able to hit back and eventually break this unit. After this it was a mopping up exercise for the Ogres with them killing the entire rat army. The reward for four wins – a game against NZ’s best player. Reid had cleaned my clock three weeks previously at Call to Arms and I was hoping to be more competitive this time. His army at four KotR lances, a unit of Knights Errant, a unit of Pegasus Knights, two of mounted Yeoman, a Lord, a BSB, a Paladin and two Damsels. I moved forward but had misjudged the distance to his lines leaving me outside magic range. Bad mistake. I lost a unit of bulls to his Knights Errant but was able to kill them when they overrun into my Tyrant’s unit. I managed to remove a unit of Yeoman when I charged them with my other unit of Bulls and some gnoblars. My magic phase got lucky as I hit his lord with a magic missile removing two wounds. My first gorger arrived behind his lances and Reid turned to face. Then came the two critical combats. His Lord charged the flank of my Ironguts and airballed. He ran but got away. I went into his BSB lance with a unit of IGs. but then it was my turn to airball and I was cut down. The final turns had Reid clean up a couple of my units while I was able to kill his rallied Lord with a gorger. My Tyrant’s unit held off two charging lances on the baseline. In the washup a 650 point win to Reid. I felt that I had been more competitive this time against an army that is very hard for the Ogres to face. If Reid’s the best player going around, then I reckon Raymond is pretty much up there – particularly when you consider the limited number of games he plays. This weekend he was using an Orc & Goblin list that hag Grimgor in it, backed with a unit of Black Orcs, a unit of Night Goblins with 3 Fanatics, Savage Orcs, SO Boars, Squighoppers, unit of Spiders, two units of wolves, snotlings, a Giant, a unit of orcs and two spear chuckers. I had heard horror stories about Grimgor and what he had done through the weekend so wasn’t looking forward to this, as I had no idea how to deal with him given the rest of Ray’s army. There were a few key moments in the battle. I moved forward to release the Fanatics hoping for low rolls. Unfortunately he got an “11” and a “9” putting two into the Tyrant’s unit. This was backed up by some pretty good shooting from Ray’s spearchuckers inflicting three wounds on the Tyrant (his only wounds all weekend) and two other Ogres. Ray brought his squigs into the flank of a unit of bulls who ran and I was able to charge them with a butcher. Unfortunately he airballed, died allowing the squigs to run in front of the unit he left. I was able to charge and kill the squigs but the two Orc units rumbled forward. I thought it better I get the charge and hit the Black Orcs and the Orc Boyz. I managed to kill the Orc BSB but eventually succumbed to their joint attention – and that of Mr. Grimgor. From here Ray mopped me up frontally and claimed my two quarters, while I picked off his weaker units and claimed his two quarters. A 650 point win to the Orcs. So I finished on four wins (three massacres) and two losses for the weekend. When the results were determined Reid was well out in front, followed by Raymond and myself a point further back. I was extremely chuffed to finish 3rd particularly behind such good players as the first two placegetters are. After last year’s New Zealand and Sydney GTs I have taken a step back from tournament play to concentrate on other aspects of the hobby. However I was keen to continue to play at Liber Animus as the tournament (to me at least) represented the “best of the best”. At last year’s even there was 80% power armoured armies and the top twelve places were filled with marine variants. The challenge this year was to take something that was not a marine and see what sort of performance could be achieved. In the end I decided to take Ulthwe as I had had a half finished army sitting in my games room downstairs. At 2000 points you can take some of the toys in the list as well as a solid base of Troops. I played the army in the two months leading up to Liber (about a dozen games) and it seemed to work well. We played “Black Box” with Craig having a decided mobility advantage but with a numerical advantage to the Ulthwe. The key point in the game was when the 30 Fire Dragons disembarked from their Serpents en masse. The Ulthwe absorbed the fire and in their next turn through a combo of fire and assault wiped out the three squads. This left the Swordwind relying on its three scoring vehicles to hold the objective. The Ulthwe were able to bring numbers to bear and won a close game 3-2. PEG (Pointy Eared Git) of the Match for the Ulthwe were the Guardians whose fire reduced the Swordwind infantry. So onto the tournament proper. This grudge match had been talked up for months in the Liber Forums. The intelligence war raged with Brad threatening a 180 model Witchhunter army and me responding with a three Defiler “TT Slaanesh” army. In the end Brad decided on Wych Cult. The special character Lilith with retinue of wyches, 6 further Wych squads of 8, Hellions, Reavers, Warp Beasts and two Ravagers. “Beacon” is a “Cleanse” variant. I had hoped that I would play this mission versus Brad. I felt that the ability to push back was critical in this and force the DE to brave fire on the way in. To get this pushback I used my Falcon in a forward position. Brad had 12” assault on three squads which made them the main dangers. In retrospect the game went pretty much as I hoped. I was surprised that Brad was as conservative as he was with his squads, deploying well back. This allowed me to push the Council and the Banshees forwards to absorb any attacks. The firebase units dealt with any of his army that pushed into my quarter. PEG of the Match was the Falcon which pushed the Wych army back then ran straight to the back corner of the Wych deployment quarter. Here it was able to rain shots from behind the Wyches as well as contest the quarter. In the end a narrow victory to the Ulthwe. Brad was a great opponent with the game being everything it promised. As a result of this match Brad will be sporting a hair hat in a few weeks. This was one army I wanted to play. We had called into GW Ringwood on Friday and saw the army in bare plastic. Ben put it together and painted it in three days. The distinguishing factor was the number of Monstrous Creatures – 6 Carnifexes, Hive Tyrant plus 3 Tyrant Guard. These were backed up by rippers, genestealers with Broodlord, raveners and gaunts. I fancied my chances as all the big bugs only moved 6” and with Escalation started off the table. Oh, misplaced confidence!! First the markers all scattered towards Ben’s edge and then in the six turns we played there were five of Night Fight (each turn on 4+). In the end I reduced Ben’s army down to five models (two on a single wound) but he held the critical counter. I had a series of chances to win but none came off. We rolled the critical die for another turn but it was not to be. PEG of the Match – Wraithlord who saw off the gaunts, raveners before falling to a Carnifex. So a loss for the Ulthwe though I collected a lot of points as I still had well over 1200 points left. Ben was an excellent opponent and I loved his list. I struggle to see why people dislike the Godzilla nids as they have real built in disadvantages. This game relies on you holding your own objective while destroying you opponents. I felt I had a mobility advantage against Ben and so split my army. I felt Ben’s deployment was more geared to attack rather than defend. The Guard had four vehicles that could really hurt my army – quickly! The two Demolishers were obvious targets but the two Hellhounds were my alpha targets given the lack of cover saves my guardians received. Unfortunately for Ben this game had the greatest skew of luck I have ever seen in a game. I couldn’t fail a save and Ben’s dice were abysmal. I managed to knock out both Hellhounds early and then the two Demolishers. In the end the Seer Council backed by a Wraithlord ran over the IG defenders to blow up the objective. I then had sufficient to hold onto my own. Ben took his appalling luck very well and was a great opponent. I definitely caught the Ulthwe on a day when everything went right. PEG of the Match were the Council. They took out a Demolisher and two depleted squads before destroying the objective and Ben’s command. Andrew had a very well composed Space Marine army with 3-4 Troop choices, a three speeder squadron, a squad of attack bikes, two predators and a dread backed up by a Chaplain and Force Commander. First few turns we traded shots with my focus on his speeders and his bikes. I managed to remove them before the box came down. I lost the Falcon and a Wraithlord to Andrew’s firepower. The shuttle came down and scattered towards my lines. In the ensuing crash I had six units entangled allowing Andrew to push forward. However he was outnumbered about 2:1 in scoring units that could impact on the result. Over the next couple of turns I was able to remove two Troop units, two Predators and immobilise the dreadnaught. The Seer Council was whittled away so that by game end it was down to 3-4 members. PEG of the Match – The Seer Council. They bagged two Predators, a troop squad and the Force Commander. They were scoring at the end of the game but bore the brunt of the Marine attack. So you travel 3000 miles to play someone 500 yards from home. Just jokes. I was lucky to play only one New Zealander, I know Hagen and Dave Cleverley played three each. Hagen and I had played this very mission two weeks ago in a practice match and it is a very very hard one for his Guard to win versus my army. He has written up a report elsewhere but I will concur that a key moment was the lone Banshee rolling morale at –5 to stay in combat. This allowed the Seer Council to intervene and from there a significant part of Hagen’s firepower was whittled down over the next few turns. My Hero was allowed to advance largely unimpeded backed by the two Vypers. Hagen pushed his Hero plus 4-5 units forward but the Eldar Guardians backed by Wraithlord and Falcon ground them down until only the Hero left. PEG of the Match – probably the Banshee who bought time for the Council to go on a wrecking mission where they killed a Demolisher and seven units. This is only the second time we have played in a tournament but like all our games was great fun. I felt that the mission stacked the odds in my favour so it wasn’t an entirely fair contest. A straight VP harvest at the top table. As primarily a Death Guard player I had good knowledge of Troy’s army. He had four squads of marines (two in rhinos), two of plaguebearers, defiler, land raider, terminators and a winged prince. Halfway through deployment, troy released that I was setting up a refused flank. He then started to do the same. Playing his intelligence card he was able to redeploy his land raider but this left his defiler and one foot squad facing most of my army. I figured my best chance was to go for his high value models to try and eke out the required 200-point advantage. My vipers concentrated on the Land raider and the Terminators while the Falcon flew forward towards the near Troop squad with the squad of Banshees. The Banshees assaulted the Plague Marines on Turn Two and did nothing! But die! Troy brought down his Plaguebearers to shore up this flank as I staged a withdrawal on my left. The Seer Council took out the Defiler and were charged by the Plaguebearers while the full weight of firepower destroyed the Banshee-killing marines. The table now turned 90 degrees as we started to fight lengthways. I lost a Vyper to the Prince and a swapped a Guardian squad for a squad of Plaguemarines. On my last turn I needed to score some Vps and managed to immobilise a rhino, and reduce a squad below scoring.. However the key was the Rangers coming through and removing two wounds from the flying beastie!! In the final wrap-up I was about 250 points ahead in a tight, tactical game. This left me on 103 points out of 120 for Gameplay which was enough to win the “Bloodthirster” for Best Gameplay score. But Liber is not just about Gameplay. I was lucky in that I played six very good opponents with six nice armies. I believe I gave out two Excellent Armies and four Good Armies over the weekend and two Excellent Games, three Good Games and one Average Game for Sports. In return I received a Good Game + average for Sports (47.5 points) and a Good Army average for Composition (45 points). I’m pretty happy with that when it is put alongside a 5 Win: 1 Loss record. A lot comes down to luck of the draw and I think the opponents I drew resulted in five good games (the one exception was against Ben’s Guard where the luck was so skewed it destroyed the game as a contest). In the end I finished Second half a point behind Bryan Cook, earning myself the title of “Commissar” for the second year running. Given the quality of Bryan’s army and his solid allround performance (he finished 5th in Gameplay, 1st in the Harlequin) I am pretty happy to be there. Thanks to Kane, Leigh and Myles, Big Red and the Ringwood Club for another great tournament. I had Jack with me over the tournament and I appreciate all the efforts people made to make him feel part of the event. Special thanks to Stu for organising the accommodation. I’m sure it was like herding cats at times. One of the highpoints is the Ringwood Regent and mixing with the out of staters. The New Zealand crew was excellent to travel with. I hope the hype Richard, Hagen and I built up prior to the event met your expectations. Greg Rae and I travelled over to Sydney for the GT, staying at the Travelodge. Dave Millar crashed on the floor of our room and kept all awake with his snoring. On the Friday afternoon I got to play Troy Forster (the Warmaster from this year’s Liber) in a game for posting on his website diary. After a most enjoyable couple of hours, we had a hard-fought draw. 40k was the winner! Going into the weekend, I rejigged my Emperor’s Children army list. For a couple of years I kept largely the same list built around Termies and Noise Marines with daemon support. At this year’s NZGT I painted some steeds and with the drop back to 1500 points I had to drop the termies to keep them. My targets were a podium finish and to win the Best General (I prefer to call it Gameplay) award for highest battle points over the sixth round. The two draws were very close to wins, in both cases my VP margin was 200+, however GW were using 250 VPs as the hurdle (rather than the rulebook 150 VPs). This gave me 101 battle points which was 7 or 8 ahead of the next best. On show were some very nice armies. I particularly liked Scott Grey’s Nids, one of the ork armies (sorry name escapes me but I did give it one of my votes) and my favourite John Travers 13th Company. After voting I had a close look at a Fallen army (Bails?) and realised that it was right up there with John’s. Yet to see the final results but it my soft scores obviously were enough to preserve a gap as I was called out for First Overall. Thanks to all my opponents over the weekend plus all the oither competitors. Thanks also to the Daves who ran a very enjoyable event. And now for my little gloat :cool: . Last year before the Australian GT, Alex Ozane posted the question on WargamerAU “Are the Emperor’s Children Overpowered?”. The Sydney result gave “Challis Drant” his 5th Grand Tournament win (plus a 2nd at this year’s Brisbane GT). Over those events he picked up three Best Gameplay, three Best Army, two Best Painted and two Players Choice. On top of that he won the other three New Zealand tournaments he played in plus the Conflict doubles. In six GTs (33 games) he lost four times – Ben Ricketts’ IG (2003 NZGT), Adrian Tchen’s Tau (2004 Australian GT), David Potts’ [Delrogue] LatD (2005 Brisbane GT) and Chris Parkin’s [Systematic] Iron Warriors (2005 Brisbane GT). In the twenty other tournament games in NZ he lost won other – to Jason Holland’s [Kruger] Iron Warriors. The only time in Australasian competition that Drant’s Warband didn’t finish First Overall was when they finished 2nd behind Jason Isaac’s [Wolverine_nz] Nids at this year’s Brisbane GT. On that basis I guess you’ve got to say that they must be overpowered.